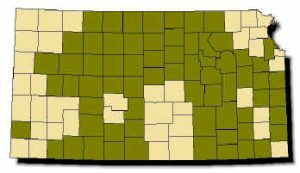 Range: Found throughout most of Kansas, but absent from High Plains north of the Arkansas River and northeastern corner of state. Description: Harmless. Weakly keeled scales; a pattern of 25–45 squarish brown blotches on grayish back; a checkerboard pattern of white and black or dark gray markings on belly. 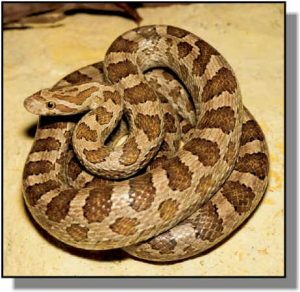 Young resemble adults; almost indistinguishable from young Western Rat Snakes. Habits: Roams rocky hillsides and canyons and frequently inhabits caves; avoids heavily forested regions. Active from March to September; primarily nocturnal, prowling for food. During day, remains hidden beneath rocks or in caves and crevices. Number of eggs per clutch ranges from 3-30. Constrictor. Feeds primarily on small rodents and birds. In region of caves, eats bats.